Four members of NIU’s Operating Staff have been chosen to receive the Outstanding Service Award for 2016. The recipients are Brenda Hart, office administrator, Department of Marketing; Ruperto Herrera, application programming analyst, Division of Information Technology; Lynne Meyer, office support specialist, Department of Foreign Languages and Literatures; and Lise Schlosser, office manager, College of Liberal Arts and Sciences External Programming. About 1,530 employees make up the Civil Service staff. Each year, four are selected by a committee of their peers to receive the award of plaques and $1,500. They will be honored at a Thursday, May 5, banquet. Here is a closer look at the recipients. The office administrator, a 12-year NIU employee who took her current job five years ago, is regarded as excellent in planning activities while continually accepting “more and more” duties without additional compensation. Her long list of coordination responsibilities includes the scheduling of courses, the department’s awards ceremony, luncheons for current students and prospective ones, the Student Appreciation Hot Dog Day, the holiday food drive, student evaluations of faculty and the work schedules of graduate assistants. “Brenda is a major reason that I hear so many people that the Marketing Department is simply one of the best places to work on campus,” said Tim Aurand, the James E. Thompson Professor of Marketing. Hart has served as president of the College of Business Staff Council, advises the dean on issues and policies regarding support staff and is a member of the college’s Strategic Planning Council. Outside of work, she has volunteered with CASA (Court Appointed Special Advocates for Children), Hospice, the Northern Illinois Food Bank and the DeKalb County Industrial Management Association. When NIU needed a more modern, more functional online directory, it was Ruperto Herrera who tackled that challenge. Those who describe Herrera as “extraordinary, amazing and exemplary” weren’t surprised. He already had implemented a better platform to deliver streaming audio and video content. He oversaw the development of a smartphone app for NIU. He led the development of a custom building block for Blackboard that allows NIU faculty to send course grades directly into MyNIU. 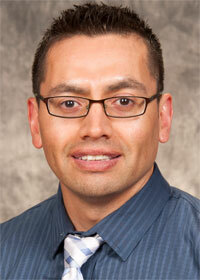 Last spring, Herrera agreed to serve as a technical lead for the Program Prioritization Data Support Team. The double NIU alum, who hold a bachelor’s in computer science and a master’s in management information systems, joined NIU in 2006. Off the job, he is a child sponsor for Juna Amagara Ministries. 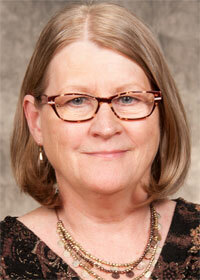 Lynne Meyer is more than someone who handles regular secretarial work. She’s more than the problem-solver who supervises work-study, manages student evaluations, coordinates the new STAMP testing program, organizes the annual awards ceremony and runs departmental elections. She’s more than the department’s “backbone” and its human encyclopedia of university procedures and policies. 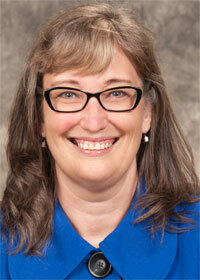 An NIU employee since 1993, Meyer is known as friendly, courteous and professional. She’s also regarded as “a self-starter” who’s “cheerfully and faithfully” taken on the responsibilities of two former colleagues in the front office. Outside of work, Meyer has participated in the Relay for Life for 15 years, serving as co-captain (with NIU professor Mary Cozad) or the department’s team: The Profe’s Posse. Never missing the annual American Cancer Society event, for which she has raised more than $1,000, Meyer often addresses the crowd, walks the track and recruits others to the cause. 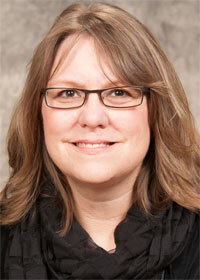 Although Lise Schlosser’s title includes the word “office,” much of the 12-year employee’s work takes place elsewhere. Schlosser has led travel programs to Canada for the Stratford Festival. She’s accompanied one-day trips to Chicago Shakespeare Theatre productions, and has organized several “movie meet-ups” with Lifelong Learning Institute (LLI) members. Meanwhile, the Ph.D. candidate in the NIU Department of English has taught the English portion of the ACT Test Prep course offered through the College of Liberal Arts and Sciences External Programming. She has ensured that academic summer camps ran smoothly, assisted in the implementation of new camp processes, encouraged the creation of a summer camp staff handbook and instituted a mandatory staff orientation. Volunteering to teach study groups for the LLI, meanwhile, prompts her to spend several hours of free time planning, and conducting research for, those classes. Away from work, she also has volunteered for Northern Public Radio, the Illinois History Expo and NIU women’s basketball.